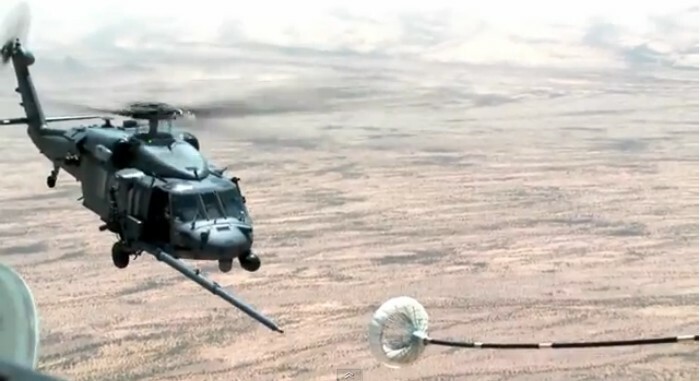 The following video depicts two HH-60G Pave Hawk helicopters refueling from an HC-130J Combat King II during Ex. Angel Thunder 2013. Watch the helicopters blades coming dangerously close to the refueling hose as the pilots struggle to get in the proper position to plug the IFR (in-flight refueling) probe into the low speed paradrogue (or “basket”). Ex. Angel Thunder is the world’s largest Personnel Recovery exercise providing the most realistic PR training environment available to USAF Rescue forces, as well as their Joint, Interagency, and International partners from Brazil to Uruguay.